This charming, detached four-floor villa offers a comfortable, family-friendly and relaxing four bedroom, five bathroom holiday home. Every room in the villa as well the 4 balconies and 3 outdoor terraces provide stunning, panoramic views of Kalamar Bay and the surrounding olive groves. The villa also offers a private pool set in a beautifully landscaped garden. The sea, beach club and deep sea diving center are a 5 minute downhill walk from the villa. Villa Tymnessos is an easy 5 minute stroll from the nearest shops and restaurants and the lovely village of Kalkan is a short walk from the villa. Villa Tymnessos's many balconies and terraces guarantee our guests unrivalled sea views, romantic and breathtaking sunsets and cherished memories of their turquoise coast holiday. The villa offers a nice selection of quiet outdoor spaces to relax and enjoy the stunning sea and olive grove views, including 4 sea-facing balconies with exceptional views. Guests can enjoy the shaded slate floor terrace on the pool level and a shaded dining terrace on the 1st floor. The popular roof terrace offers unmatched and uninterrupted sea views across Kalamar Bay and the surrounding countryside. A wet bar/kitchenette and fridge is located on the roof terrace level so guests can enjoy their favourite refreshments while watching the sun set. The villa offers a pool and beautifully landscaped, colourful garden. The pool terrace has sun loungers, and comfortable chairs. A private and refreshing outdoor jungle shower is nestled in the lush gardens. A Turkish charcoal BBQ grill is available for guest use. Villa Tymnessos's many balconies and terraces guarantee our guests unrivalled sea views, breathtaking sunsets and cherished memories of their turquoise coast holiday. Villa Tymnessos is conveniently located in Kalamar Bay within a 5 minute stroll of the sea and beach club. Cafe Vita is a 5 minute walk from the villa towards Kalkan and offers wonderful Turkish and Continental breakfast, lunch and dinner options. Many tourists and locals are seen reading the morning newspaper here as they enjoy their tea or coffee. Guests can also buy their fresh morning bread from here if preparing breakfast in the villa. Two small family-run mini-markets with farm fresh fruit and vegetables are located within a 5 to 10 minute walk from the villa. The lovely village of Kalkan is only a 15 minute walk or less than 5 minutes by car from the villa. Kalkan offers many excellent and well-renowned Turkish and International restaurants, enticing shops, a picturesque harbour and many outdoor cafes that take advantage of the incredible vistas that the village offers. Watch the sunset from the little harbour or wander through Kalkan’s cobbled streets and whitewashed buildings. Our property manager will assist you with making transfer arrangements from either Dalaman or Antalya airports. We recommend ADDA Tours, a licensed and reputable transfer company, who will meet you at the airport and take you directly to Villa Tymnessos. The non-stop transfer time from Dalaman Airport to Villa Tymnessos is about 1 hour and 20 minutes. Transfer from Antalya Airport usually takes around 3 hours and generally includes a short stop. Once you arrive at Villa Tymnessos, a car is not required to enjoy all that Kalamar Bay and Kalkan have to offer. Local dolmus (mini buses) run frequently throughout the day during the summer and local taxis are always available and provide a convenient and inexpensive option. Several car, mini-van and scooter rental agencies are available locally should you wish to hire a vehicle after arrival. Both Dalaman and Antalya airports also offer several vehicle rental options. We are a family that loves to travel. We have always talked about owning a little place somewhere where we could escape from the world. We found that in Kalkan and Villa Tymnessos is our escape. 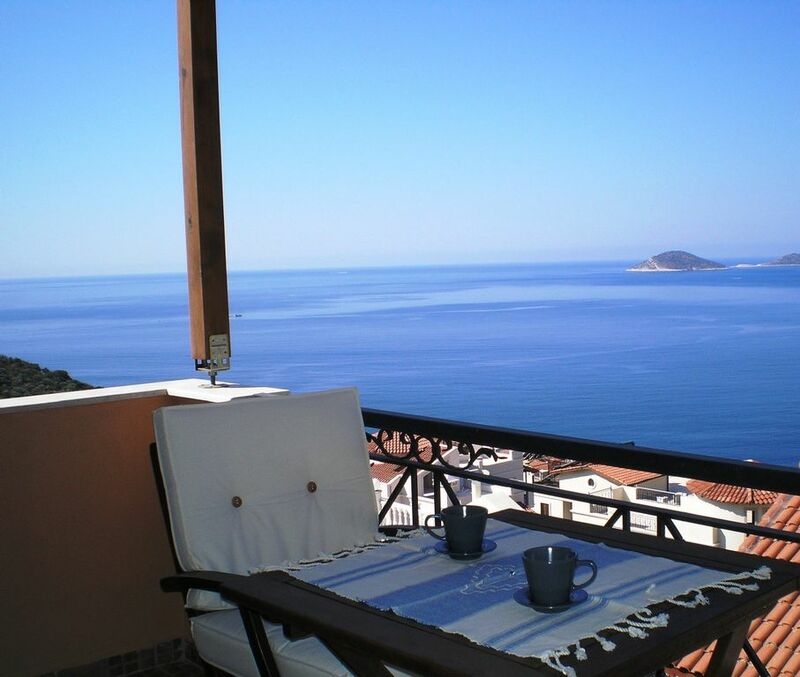 We fell in love with the tiny village Kalkan during a visit in Summer 2005 and returned in 2007 to house hunt. Villa Tymnessos was the first villa our agent took us to and it was perfect. We wanted a home that we could someday live in year round, that could accommodate our family reunions, that was a safe and child-friendly place to raise our family, and offered sea views and sunsets that we would never tire of enjoying. We love wandering through the quaint village and reliving the fond memories of past trips and renewing friendships with the local merchants. Once you eat the local food and experience one of the special Kalkan sunsets, you will know why this little village is so special to us. We have tried to make the villa feel relaxing and comfortable like a real family home should. The villa is located in Kalamar Bay, which is very quiet and away from the tourist focus of Kalkan village, and which we believe adds to the serenity and relaxing atmosphere of the villa. We have decorated the villa with many locally produced crafts and linens, and we try whenever possible, to buy local. What makes the villa so special? It has to be the view. Where ever you are in the villa you have incredible views of the Mediterranean, the neighboring olive groves, the goats wandering the hill to the right of the villa, and the Taurus mountains behind Kalkan. But it will be the sea views that will always grab your attention and which you remember after your return home. toilet, shower, En-suite. Large walk-in shower with rain head & body spayer. toilet, Located on the 1st floor. The Master bathroom is en-suite and offers a large walk-in shower. The 2nd Master bathroom is en-suite and offers a large walk-in shower. The bathroom for Blue bedroom is located adjacent to the bedroom with both bath and shower available. The bathroom for Red bedroom is located adjacent to the bedroom with walk-in shower. All bathrooms have hair dryers. Bedlinen, luxury wrap-around bath towels, and large pool/beach towels are provided for guest use. A once per week clean and linen/towel change is provided for stays of two weeks or longer. Extra cleaning and laundry etc can be arranged at a nominal cost. French press, Turkish coffee, and a Turkish tea samovar. Our property manager provides a small welcome basket containing essentials. A small mini-market is a short 5 minute walk from the villa. The kitchen is fully stocked with long-term guests and families with children in mind. The outdoor terrace has a large dining table and a smaller 4 seater dining table is provided in the kitchen. The villa has 2 living rooms and a SMART television and DVD is provided in each allowing separate entertainment for different members of your group. Includes movies for kids and adults. Available for rent through the Kalamar Bay Beach Club. Boat rentals and excursions can be arranged at the Kalkan harbour. Our property manager can also provide suggestions and recommendations. Villa Tymnessos boasts 4 sea-facing balconies & 3 outdoor terraces guaranteeing superb views. The living room on the 1st floor provides comfortable furniture, television, English and European language satellite, DVD, a radio/CD/MP3 player, and has brilliant views. This room leads to a private balcony with sea-views as well as the large outdoor dining terrace. A large family room on the pool terrace level offers comfortable furniture and a large fireplace for cooler months and is a great setting for playing board games or reading. Large French doors lead to the shaded slate floor terrace, pool and gardens. The bright main kitchen is fully equipped with electric and gas hob, electric oven and extractor. Dishwasher, fridge/freezer, microwave, toaster and kettle are also provided. The main kitchen also has an informal dining table that seats 4 adults. A utility area is located on the ground floor with washing machine, dryer rack, and iron/ironing board which guests are welcome to use. What a wonderful holiday we had at Villa Tymnessos. The Villa is gorgeous - super spacious, well appointed, with everything you could hope for on a beach vacation. We loved the bougainvillea and trailing honeysuckle that flourishes in the garden. It really adds to the Mediterranean ‘exotic’ holiday feel. Being on a hill, the views from the Villa are fantastic. The roof-top terrace is a real treat, a great place for both early mornings and sunsets. In fact, the hardest part of our stay was deciding where to sit for breakfast each morning! We highly recommend getting your freshly baked morning bread at one of the local cafés - we shopped at Can Can - which is no more than a 10-minute walk from the Villa. Even though our stay was at the end of October, a good few swims were had in the fabulous pool. And for non-swimmers, there is no lack of places to sit, read and/or snooze – upstairs or downstairs. Each day was like finding somewhere new! There is plenty to do in the town itself. Sean and Morgan have compiled an excellent recommendation guide which helped us navigate our way around. A stroll through old town and the harbour will keep you entertained, not to mention well-fed. We took the local bus to Kas for lunch on one of our days, which very easy to do and a great experience – again we recommended it. The Beach club too was excellent. We spent two afternoons there, lunching, swimming and doing… nothing much. The service is good and, if you don’t fancy the hilly walk back, they offer a shuttle service. It was always good to come back to the Villa – being slightly out of the town, means that it is quieter, which we appreciated after a long day of ……doing nothing much. Thank you Sean and Morgan for sharing your Villa with us. We will be back! Linda and Dieter. Thank you for your wonderful review and we're so glad you enjoyed your stay at the villa. Guests regularly comment on the choice of outdoor spaces, so we're thrilled you took advantage of the villa's many balconies and terraces. Like you, we love the proximity of the Beach Club, and the fact that they provide a courtesy shuttle to the villa, is a real bonus. We look forward to welcoming you back to the villa in the near future. Brilliant holiday home. Perfect for a relaxing family holiday. The views are spectacular and the villa is exactly as advertised. There are loads of balconies and terraces so it never feels crowded, even with a large family. There are even 2 family rooms on different levels which works great when the kids need their own space, DVDs and television. Even though we visited in October, the pool was great and the town was busy, which kept the kids entertained. Perfect holiday! Having been invited to a wedding in Kalcan and looking through the range of available options we went for this villa and we were not disappointed in any way. The villa itself is well appointed, clean and has all you could need. It has stunning views of the Turkish Mediterranean sea, especially from the roof terrance. The private pool was something we utilised every day. The villa's location was ideal for us as it was close enough to the town to be able to walk there easily but for enough away to be quiet in the evenings. The hosts had arranged a simple 'welcome pack' of supplies and due to flight and car rental delays we didn't get to the town until nearly midnight and yet the local contact came to meet us and made sure we were in the villa. I had never been to Turkey before but if you are interested I can thoroughly recommend the place and this villa. For us there was just the two of us and we enjoyed the space but the villa is big enough for a couple of families to be in the place without being on top of each other. Thank you so much for the wonderful feedback. We're thrilled that you had such a wonderful holiday at the villa and that your first visit to Kalkan and Turkey was such a positive one. Thanks for choosing to stay at Villa Tymnessos and we hope that you will consider staying with us again should you visit Kalkan in future years. The villa is perfect! spacious and has million dollars views! it is the best rent i have do so far and i’ll do my best to return back in the future. thank you Sean, Morgan and hamza for your help and clear explications. Thank you for sharing your experiences - we are so glad that you enjoyed your stay at Villa Tymnessos so much. Thanks again for choosing to stay at our villa and we look forward to welcoming you back in future. We had a wonderful time, we stayed for 2 weeks from the 12th August as 2 families, 8 of us in total. Sean and Morgan couldn't have been more accommodating and helpful during the booking and stay and Mustafa who looked after the grounds and pool was great and very helpful. The villa is lovely, nice and modern inside with some great views from the main bedroom floor and especially the roof terrace, a must for sun downers. The kids loved the pool which thankfully with the heat does enjoy some shelter throughout most of the day. We enjoyed being just outside Kalkan in Kalamar Bay, about 15 to 20 minutes walk as it was a little quieter and has easy access to Kalamar bay beach club just below which was great, and with taxis being cheap and regular it is not an issue, and there are a number of restaurants and bars just a stone thrown away on the walk in. We loved the area, plenty to do and the restaurants, service and people are great. Other than the great restaurants in the old town, there is a ton of things to do on the door step or within a decent drive from scuba diving or going out on a boat with Captain Lucky, to gorge walking and enjoying the beaches. Our first time in Turkey and we think we came to the right place, we will hopefully be back. Thank you so much for taking the time to share your experiences - we're delighted that you had such a good stay at Villa Tymnessos. Everyone raves about the views from the villa, especially sunsets from the roof terrace, so we're glad to hear that you enjoyed these. Families frequently comment on how quiet and relaxing the Kalamar Bay area of Kalkan is and yet all essential amenities are close by, including restaurants and the beach club which is a short stroll down the hill. Kalkan really has so much to offer - we're thrilled your first visit to Turkey was such a positive one. Villa Tymnessos is conveniently located in quiet Kalamar Bay. The sea, beach club and the deep sea diving center are a 5 minute downhill walk from the villa. During the summer shuttle buses run throughout the day from the road above the villa down to the sea front. For a small fee, the Kalamar Beach Club provides water-side sun loungers, parasols, adult and children’s water activities and a restaurant. The lovely village of Kalkan is only a 15 minute walk or less than 4 minutes by car from the villa. Water taxis and shuttle buses run frequently between Kalamar Bay and Kalkan during the daytime in summer. Kalkan offers many excellent and well-renowned Turkish and International restaurants, enticing shops, a picturesque harbour and several outdoor cafes. Rates are inclusive of Turkey's 18% VAT for hotel and accommodation rentals.